With its captivating traditional two-tone design, the 7'7"x10'10" Fresco Simcoe Tan & Brown indoor/outdoor mat features a blend of subtle tan and brown colours which adds coziness and warmth that will complement any living space. This premium rug is made with high quality polypropylene fibbers, resulting in a mould, mildew, and stain resistant flooring solution for your home. Densely woven, this flat weave structure provides unmatched durability and longevity while making it effortless to clean: simply spray with a hose or wipe with a damp cloth. Crafted and made in Egypt. This natural colored mat is perfect for all your needs. It can be used outdoors or indoors depending on your needs. It is made from 100% Olefin, which makes it stain resistant and easy to clean. A bold, vibrant palette of colour is the signature of this weather-resistant, Indoor/Outdoor collection. The Veranda collection combines the benefits of outdoor functionality with the pizzazz of contemporary fashion. The contrast of earthy neutral colours with exciting, brilliant accent colours create an exciting new element to your dicor that brings any space to life. Ethridge is a bold and vibrant colour palette that beautifully accents this elegant floral motif. The brown background is perfect for the bright colours stand out in this beautiful paisley design. Design your home today! Courtyard Alex Brown 5 ft. 3 inch x 7 ft. 7 inch Indoor/Outdoor Area Rug Place this Safavieh Courtyard area rug in your dining room when you need a splash of style. Designed for your hallway, dining room, or living room, this indoor/outdoor piece made from plush synthetic material looks and feels great. This product is machine-made, which assures quality. 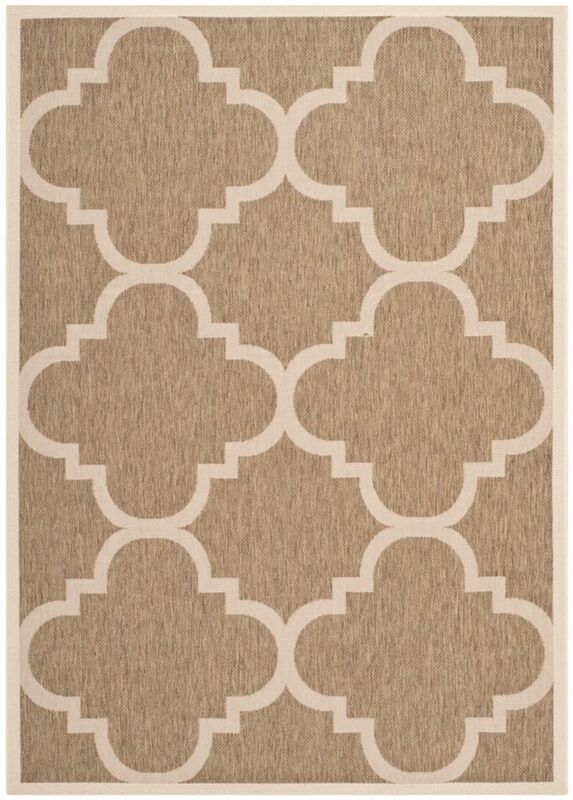 Include this geometric patterned beige tan rug in your living spaces for a high quality and high fashion look.